Year 1 - Instead of leaving the building standing empty during the 12 month consultation. We propose continuing the existing soft play, parties, toilet provision and seating area (front of house, see diagram). The income from these will cover the costs of keeping the building maintained, insured and heated with one member of staff supervising. All the existing systems and procedures can be continued and adapted by the community. During this time residents can choose what is the best plan for the building. Year 2 - If the community choose to put soft play in the pool, it can be refitted without affecting the front of house soft play. 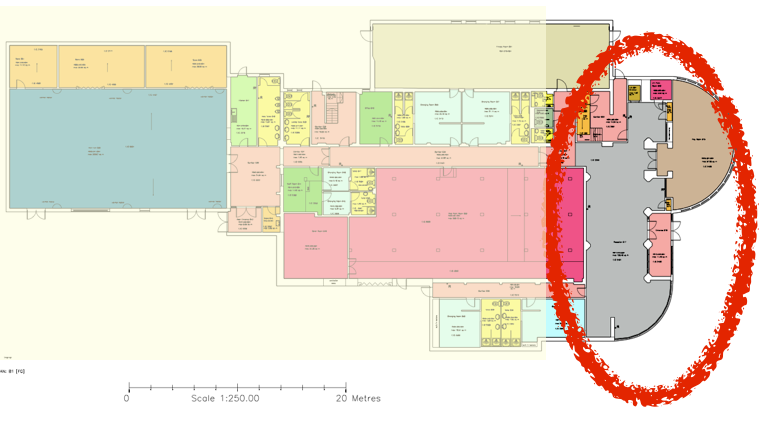 If the community choose to allow demolition of the main building then the contract with BAM can be implemented, and soft play put in the back hall. Year 3 - Open the new soft play. The large soft play will make 125k and cost 100K p.a.